Spring is my favorite time of the year for so many reasons. I’m back in my garden, seeds are sprouting, flowers are blooming, and birds are nesting and singing. From hummingbirds zipping around my garden to eagles nesting across the valley, we have a huge variety of birds to appreciate. Get your birding book out and enjoy learning about these little chirpers! 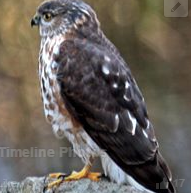 This photo was found Googling birds in the San Juan Islands. And Orcas celebrates our feathered friends with a little help from the Orcas Island Chamber of Commerce, which hosts the annual Birdfest, a celebration of birds! This year, the Orcas Island Birdfest runs for four days: Thursday, April 30 through Sunday, May 2. The schedule is packed with bird walks and nature tours, workshops, a fine art exhibition and scientific symposium, all focusing on the wonder of birds and grassroots solutions for maintaining healthy populations. Even if you are not a “birder,” this is an unforgettable experience showcasing the natural splendor of the San Juan Islands. 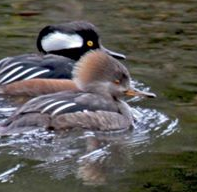 Hooded Mergansers at Otter’s Pond, ready to have ducklings in a month. Grab your binoculars, pack your Birding in the San Juan Islands by Mark G. Lewis, put your hiking boots on and get ready for some local color and sound. 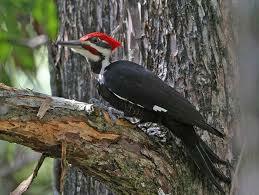 Pileated woodpeckers are easy to spot. Visit www.otterspond.com for a list of birds you can see on Orcas Island. For information about the 2015 Birdfest and a complete calendar of events, visit OrcasIslandBirdFest.com. Life on Orcas is going to the birds! Don’t believe me? Come see for yourself on April 10 – April 12. On Thursday, April 10, Orcas kicks off the first annual Orcas Island Bird & Wildlife Festival with a dinner at Rosario Resort’s Beach House. Featured speaker will be Thor Hanson, conservation biologist and author of the book Feathers. Hanson lives in the San Juans and will share his knowledge of all things wild on Orcas Island. There will be a Silent Auction to add to the fun, and help secure funding for future festivals. The perfect place to stay while experiencing the festival is at Otters Pond Bed and Breakfast. Otters Pond, renowned as a prime birding spot, is home to hundreds of bird species and certified by the National Wildlife Federation as a Wildlife Habitat. At the breakfast table, you will enjoy a front row seat to flurry and feathers and as a variety of birds dine in the feeders just outside. 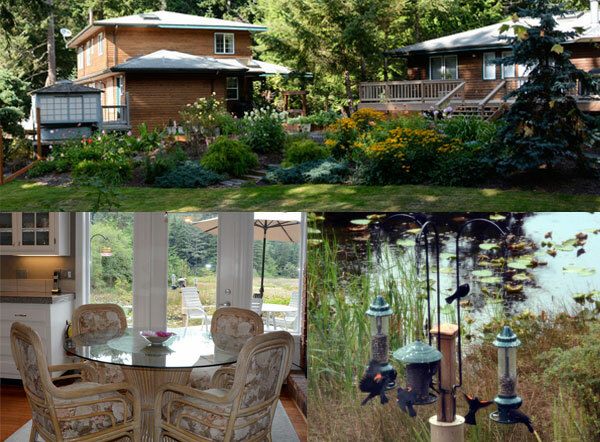 Innkeepers, Carl and Sue Silvernail, provide more than a ton of bird seed each year to attract some of the Northwest’s most colorful flying wildlife. Enjoy a front-row seat to flurry and feathers at Otters Pond Bed and Breakfast. Sue reports that just this week, they are seeing Chestnut-backed Chickadees, Dark-eyed Juncos, House and Purple Finches, Red-Breasted Nuthatches, Spotted Towhees, Crossbills, American Robins, Sharp-shinned Hawks, American Bald Eagles, Anna Hummingbirds and Red-winged Blackbirds. On the pond they are seeing Hooded Mergansers, Ringed Neck Ducks, Pied Billed Grebes and Mallards. She says they are watching for Rufus Hummingbirds, White-crowned and Golden Sparrows and Pine Siskins. 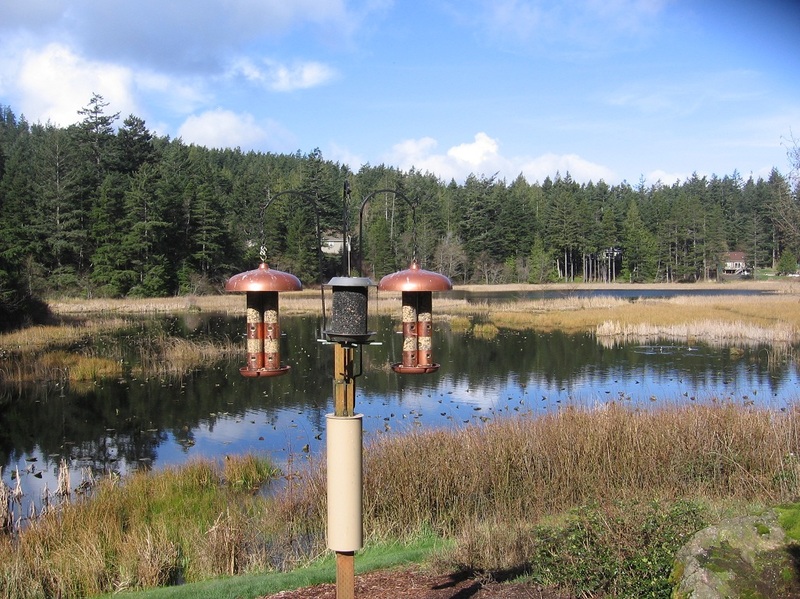 Sponsored by the Orcas Island Chamber of Commerce, BirdFest will offer activities sure to please all who enjoy the birds and wildlife of the Pacific Northwest. The still-unfolding line-up of walks, talks, workshops and activities are ideal for all ages and experience levels. Stay tuned for more information and events to be announced! Meanwhile, here are some helpful links to help you plan for BirdFest. And if you want to stay forever, find out more about Otters Pond B&B for sale. And I’m not talking about Seahawks fans – although there are plenty of those too. Orcas Island – and the rest of the San Juan Islands – is home to many bird enthusiasts. There are guided bird walks, Frank Richardson Wildfowl Preserve, and of course we’re a migratory stop on the Pacific Flyway. But I recently found another bird-loving contingent here. About 10 days before Christmas, my neighbor passed away leaving behind ‘Charlie,’ her beloved thirty-something Congo African Grey Parrot. I volunteered to find Charlie a new forever home. First stop was the Orcas Animal Protection Society where I was given names of several local parrot owners/experts to contact. All of these ladies gave me excellent info on what criteria to look for in Charlie’s new home. One offered to be foster mom until we found the perfect landing place. Next I joined the Orcas Island Pets group on Facebook. This interactive page is where you can ask for advice, trade pet supplies, post lost and found pets, and rehome or adopt a pet. The grand slam, though, came when I posted on two online Yahoo groups: “Deer Harbor Community Bulletin Board” and “Westsound Neighbor-to-Neighbor”. I was flooded with emails, phone calls and offers to help. That’s when I found the perfect home for Charlie: Ed and Amy Masters. Ed and Amy and their two teenage sons live on a 10-acre farm near Westsound. They own Orcas Island Shuttle (our local rental car company) and work from home, so Charlie will have constant attention and activity. Amy has experience with parrots and a close friend that raises parrots. She always wanted an African Grey. They’re prepared to provide a loving home to Charlie for the next 30+ years. We delivered Charlie a few days before Christmas to their beautiful 3-story A-frame home, overlooking a large pond with their pet ducks and geese. They also have horses and chickens. Charlie has now integrated well into the family and they all LOVE him! Each day he responds with revealing more of his intuitive personality and extensive vocabulary. On Christmas Eve, they allowed him to perch outside his cage for the first time, and during dinner he flew to Amy and perched on her arm for the duration of the family meal. I’m so thrilled at the happy ending to this story. 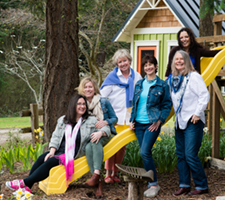 And it was made possible through the amazing community network of caring people we have here on Orcas Island. Thanks Orcas! I arrived that morning to find Carl and Sue busy in the kitchen creating tasty, colorful courses soon to put smiles on their guest’s face. 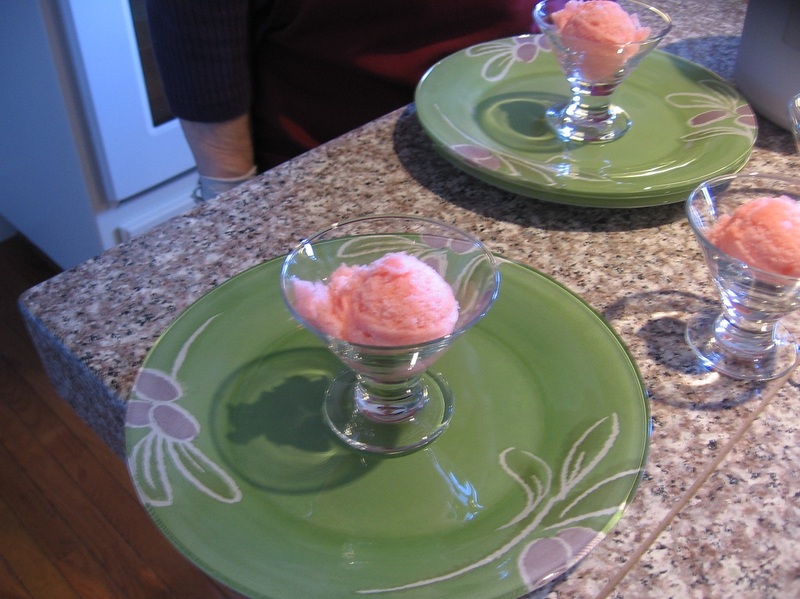 First course was a melt in your mouth guava sorbet. Presentation is everything and each course was a feast to the eye before your taste buds wanted more. Spiced baked pears followed with a very simple presentation, yet also a promise to the palette. Just when I thought it could not go on, a mini dutch apple pancake was served with lemon. I found myself asking for the recipe and Sue handed me a recipe book show casing her favorite recipes, Featherbed Eggs and Other Favorite Recipes. I served my husband dutch apple pancakes for Easter!!! I have wanted my own flock for some time now. Jay kept saying he does not want to get into the chicken business (he knows who will end up tending MY chickens, and his name starts with J!). Thank goodness for grown sons. My eldest, Eric, homesteads at the south end of our 4 acres and shares my desire to feed myself through farming. Before I knew it a coop went up and the word was out that we were looking for chickens. It is amazing what this island community will provide, you just have to ask. Great friends on Lopez had an extra hen, a Golden Laced Wyandotte, she’s a beauty!. 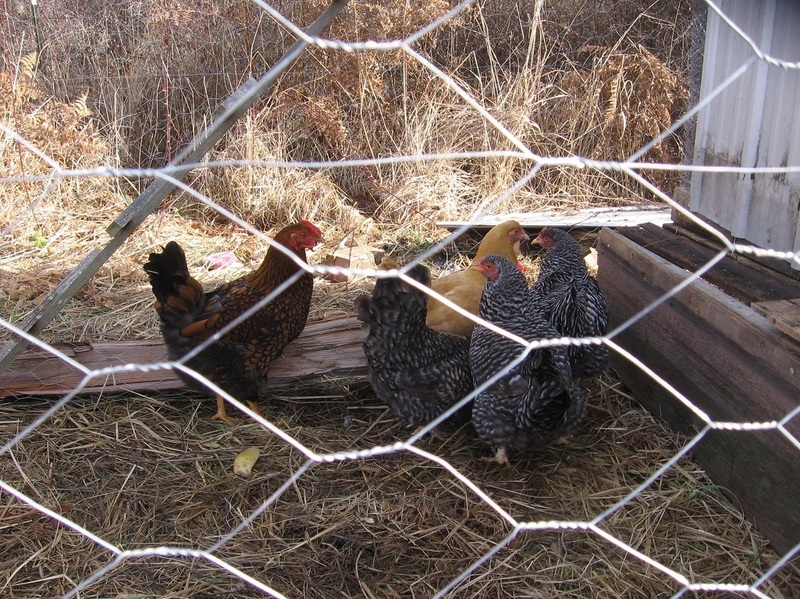 Within 5 days of coop construction, Eric had collected 5 hens with more promised as they hatched. We are in the egg business. 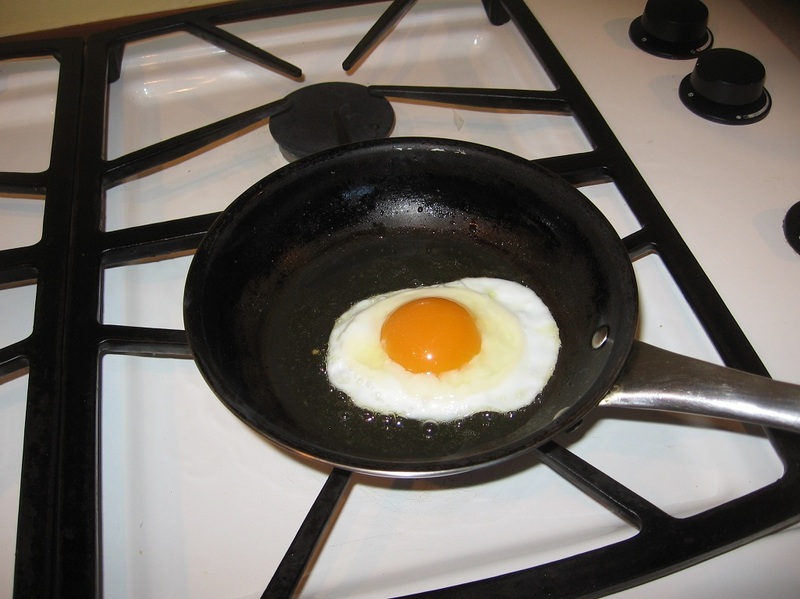 I have a feeling, if this pace keeps up, I will be blogging egg recipes and asking for your favorite way to prepare eggs! One of my favorite magazines, Organic Gardening, had a section on chickens (June/July 2010) naming pros and cons and discussing best backyard breeds, www.orgaincgardening.com.